After an epic 24 hour journey on the train from Olomouc via Vienna we arrived in Bourg St Maurice for the start of the Mountain X Race the following day. We had packaged our bikes up like blue ukelailes in order to get them on board the ICE, Inter Continental Express. Dan, Josiah and Cassidy picked us up from the station and we ate out with the other Nike team at a pizzeria. There was mist swirling about the rocky peaks as it had recently rained. We drove up the windy road after dinner to our accomodation at Les Arcs, a very famous French skifield. In the morning it was all go to get organised for the first event of the race - a 10km trail run starting at 6pm. After many hours spent gear checking and rushing around buying forgotten gear and food race time arrived. The pack took off insanely fast up the hill and it was immediatlz obvious that this field was filled with some amazing runners. Look at this guys moustache!!!! The day for the Middle Distance Qualification and Final had come around and we had an early start to get Neil to the check in (he was the first runner). The Qualification and Final were held in the same area on a rolling hillside in the drizzle which persisted most of the day. 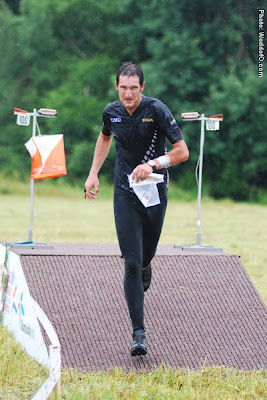 Neil charged into the finish first giving it everything. The finish shoot was grueling as we could see runners for at least 2 minutes before they crossed the line so they had to run hard for all the cheering! Ross came in next having had a great run and qualified in 15th spot...the first Kiwi to qualify for all 3 finals at a WOC. Chris flew into the finish running very strongly, but we knew he had made some mistakes because his time was too sow to qualify. 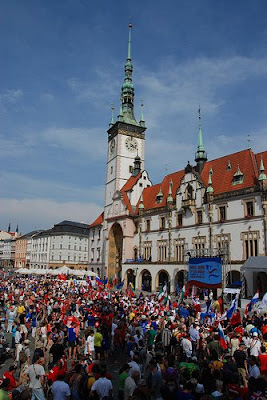 A good crowd for the sprint final in Olomouc... orienteering until a little bit of pressure perhaps? Late at night we arrived to the hustle and bustle of Prague. We caught a taxi to our rather shabby youth hostel with our tonnes of gear and slept until 1pm the next day! That afternoon we wandered the streets of Prague and ate pasta in the old town for dinner...a pleasant afternoon but not really taking to the 'clubbing scene' which draws Europeans to Prague we headed off to Olomouc (pronounced Olomoutz) the following day. Before our arrival in Prague and journey to Olomouc in the Czech Republic I posted some pictures of our final days in Big Sky. Chris out on our ride through some awesome single track in the mountains. Lone Peak that Chris climbed on the first day of the race is in the background. Plus note my very nice bike. This was THE best bed, with an enormous amount of pillows.